first we were 10. we met at fu fu cafe @ 11:30 and they had a table big enough to accommodate all of us. i ordered 5 orders of the xiao long tang bao (tang means soup in chinese - they also have xiao long bao sans soup). they are disguised as steamed pork buns on this menu and most menus in chinatown. try ordering them in chinese by saying "SHE-OW LOONG TONG BOW" b/c i guarantee that no one will understand what you want by asking for "soup dumplings." 5 orders yielded 20 dumplings, enough for 2 each. the wrappers here were the thinnest out of all the places on our crawl (the mark of good XLB), but still not nearly as paper thin and translucent as joe's shanghai in NY or din tai fung in LA. i also ordered 2 orders of scallion pancakes and pan-fried pork dumplings. the scallion pancakes are excellent here (even better than my grandma's) and although the potstickers were very greasy, they were very much enjoyed by the table. the potstickers here are beijing style and the wrappers are open at both ends which gives the oil it's fried in many more nooks and crannies to creep in and adhere to. paradise cafe was closed today so we walked across the street to classic kitchen in the strip mall behind sinh sinh. the employees quickly put 2 tables together for our large party. when i told our waitress that we were ordering 3 orders of xiao long bao and nothing else, she was blatantly rude and upset. i explained to her that we were just here to try their soup dumplings and then we would be leaving right away. i even pulled a plate of cold boiled peanuts out of the fridge to add to the tab, but that didn't seem to appease her either. when she left our table, we could hear her complaining about us to the kitchen on the other side of the restaurant. they didn't serve us any water. i think everyone at the table was too afraid to even ask. keep in mind, i am chinese, i was communicating with her in mandarin, and she knew i could hear and understand everything she was saying. i pointed out to the other chowhounds that getting bad or rude service in chinatown may not be because they aren't asian. obviously, some people are equal opportunity assholes. the soup dumplings weren't great. 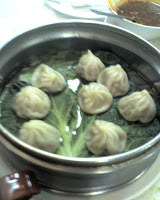 they serve 4 to an order in the small metal steamers that shui mai are served in on dim sum carts. since all 4 are crammed into a small steamer, they stick to each other and the skins rip when you try to separate them. of course all the soup leaks out which totally defeats the purpose of soup dumplings. cold boiled peanuts w/cucumbers were bland and were barely touched at the table full of foodies. a last minute impulse order of panfried pancakes w/eggs, scallions, and deep fried dough sticks was pretty good. classic kitchen is known in chinatown for its taiwanese breakfasts, although i wasn't sure if this dish was very authentic. the pancake looked and tasted identical to a tortilla. we left as quickly as we could. our waitress actually thanked us for leaving. classic kitchen wins the award for the worst service i've ever had in my life. after we left, i actually found myself wondering if they served us the soup dumplings in those tiny steamers to be spiteful b/c they were pissed off. steaming the dumplings so close to each other made the skins very gummy b/c there wasn't enough steam getting through to properly cook them. at serious XLB joints, you would never see the dumplings touching each other! this is a serious faux pas. we walked back across bellaire, married ourselves into just a few cars, and met back up at lai lai dumpling house. walking in was a blast from the past, i remember coming here as a child with my family when this was one of the first authentic chinese restaurants on bellaire and chinatown was still downtown. things have changed quite a bit since then... the crowd was very different. there were a several occupied tables, but none of them contained asian patrons. thankfully, the proprietors here were very friendly - hot tea and iced water were brought to the table w/o even asking and we were parched! the soup dumplings here come 10 to an order. we were exactly 10 people so i asked for just one order (i could tell our XLB enthusiasm was waning & i wanted to make sure people saved enough room for our finale at sichuan cuisine). the waitress (her accent was from mainland china) asked me a couple more times if all we wanted were the XLB, but she asked in a concerned way like my grandma did when she thought i wasn't eating enough. then there were 12. two more chowhounds phoned to inform me they were on their way, so we added 1 more order of XLB (which seemed to make our waitress happier) and a small table to our round one for the new guests. 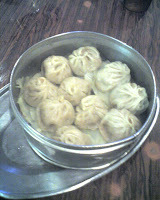 the soup dumplings were large and came 10 to a large steamer and they were also stuck to each other ripping when orphaned from the rest of the group. the wrappers were extremely thick and gummy. i suspected that they were previously frozen. the meat itself was more like the meat in a pork bun. the house-made dumpling sauce was very anglo-friendly. it was more sweet than vinegary w/no trace of ginger. lai lai fans, i urge you to check out fu fu cafe or sandong snacks. a generous tip for the waitress and then we were on the go again. sichuan cuisine! they had a round table large enough for the 12 of us w/a lazy susan in the middle. i asked for 1 order of soup dumplings to finish out the crawl although most of us were dumpling-ed out. the dumplings came 8 to an order and were actually the last thing to hit our table which i thought was poignant. they were small-ish in size more aligned with what you would find at joe's shanghai or din tai fung. the wrappers were thinner than lai lai's and classic kitchen's, but the filling wasn't anything exceptional. by now, readers, you are probably a little full from just reading this post, but our feast was just beginning! from the small cold appetizers table in the back (do not skip this! 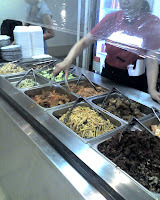 ), we ordered 2 combo plates of 3 items. for one plate i chose pickled cabbage, bamboo shoots (both in sichuan oil), and cucumbers w/garlic. the cucumbers were my favorite item on the plate but the other 2 were good too. for the second cold app plate, i chose pig ears, smoked pig snout, and sliced beef and mow. i thought all 3 were absolutely lovely. the pig ears weren't the biggest hit at the table (it was agreed it was a texture thing), but surprisingly everyone raved over the pig snout. it looked and tasted like bacon! the sliced beef and mow had the wonderful ma la that i expected - that eye-opening spicy addictive numbing sensation from szechuan peppercorns. another hot app that came to the table were the dragon wontons which look pretty innocuous until you mix the wontons with the spicy oil at the bottom of the bowl. the wontons were okay, not even in the same ball park as the ones you'd find at wu liang ye. i can eat bowls and bowls of those. 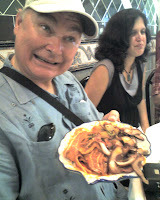 entrees included boiled sliced fish in spicy sauce (photo left), one of the best dishes at SC. 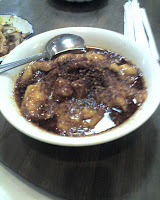 the fish comes in a bowl of chili oil that is as abundant as soup. it was funny how the chowhounds reacted after seeing this dish. i sensed a lot of apprehension at the table. 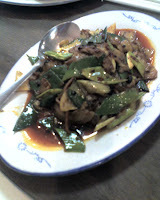 the chongqin chicken, equal parts bits of deep fried chicken and chili peppers was my second favorite dish. duck tongue w/ jalapenos pleased most of the hounds although one of the peppers set fire to jay's mouth. the obligatory double cooked pork (photo right) with leeks was as good as i remembered. i chose to temper the meal with 3 non-spicy dishes especially since anonymouseater was dining in tow with his daughter julia who is the most food savvy 9 year old in houston (and who just discovered she is a fan of sriracha! ): green beans with ground pork, crispy tofu, and tea smoked duck. crispy tofu is a favorite of mine due to the contrast in textures that i love - crispy, lightly, deep-fried shell and soft tofu-y innards. tea smoked duck was oversalted and dry. on a previous visit, it was one of the dishes that impressed me most - crispy skin, moist smokey meat - better than the versions in NY. today the dish was obviously oversmoked. the service and the entire experience was absolutely wonderful. the waitress received a huge tip and everyone got $4.50 back from the money pool that each person put $20 into for the crawl. yes, this whole experience cost us each a tad over $15. isn't chinatown awesome? so the upshot after 4 hours of dumpling research? 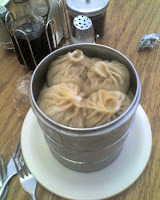 in my opinion, fu fu's soup dumplings were definitely the best. just looking at photos alone, you can tell how much thinner their wrappers were and how expertly the dumplings are constructed. but still houston's XLB offerings are very, very sad compared to my favorite pork and crab soup dumplings at joe's shanghai. oh, we're not done yet! katharine won't shut up about taro ice cream (i'm exaggerating, of course) and now we are all intrigued (or we just like each other so much that we don't want the fun to end) so we head to lee's sandwiches to relieve some of the sichuan flames in our bellies. i can't believe i haven't been to this place before. i heard the vietnamese sandwiches are pretty terrible, but they make fresh baguettes onsite. this place is just an experience in itself. it's basically a vietnamese food court all operated by the same owners who obviously have a penchant for neon signage. there are some gourmet groceries on display and a refrigerated section to pick up fresh coconut juice, flan, an assortment of vietnamese desserts, or a bowl of butter pats for $1.25. there is an ice cream stall, another line for vietnamese sandwiches and coffees, and a stand emanating an alluring vanilla baked good smell. 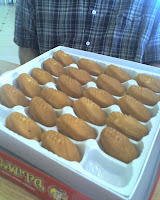 they are selling fresh, hot custard filled cakes that resemble french madelines cookies. chowhound greg aka heritoth stands in line to get a box of 24 for the group. chowhound fulmer and i sample almost all the ice creams (including durian and soursop) and settle on a scoop of mango, taro, and rocky road. some sandwich and coffee purchases too. cash only, guys! and then we settle down to a table with a gajillion plastic spoons and napkins for everyone to share in true chowhound style. poor greg is still in line for another 10-15 mins for little cakes b/c the woman in front of him buys 3 million boxes of them. he finally comes back and we decide the cakes are pretty disappointing but thank greg for "taking one for the team." around 4:30, food coma hit me like a wet towel. nap time! we say our good-byes. update: so about 5 hours later, that sandwich i picked up from lee's was calling to me. i chose the banh mi thit nguoi (combination). it's huge for $2.65. there wasn't much meat or pate, or vegetables (plenty of cilantro and jalapenos though), but the most essential ingredient that was missing was the yummy garlic mayo/aioli. 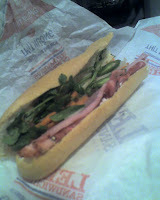 without it the sandwich was dry and boring. meh! i'm still a staunch believer that the givral hoang on bellaire in diho plaza has the best banh mi in houston. what a great food run to chinatown! i'm so impressed you went to so many places! you guys gotta go to paradise cafe. blows fufu out of the water. also, have you tried don cafe? the ladies who used to be at givral hoang now run don and in my opinion were the reason why givral was so good (and popular) in the first place. Best banh mi thit (again, in my opinion) in town. 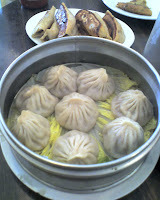 @ justin - i have tried the XLB at paradise before and the small amount of meat in the dumplings tasted freezer burned. i was hoping for a different experience today b/c the skins are thinner there than fu fu, but they were closed. Oooh, I wish I could've made it! I'm really looking forward to summer school (and stress!) to be over so I can participate some more. I've been craving pig ears for a while now and it is even worse after reading this! Sounds so good! I'm sad I missed it :( I want to try the XLB but am really excited about going back to Sicuan Cuisine and trying the pig ears. Great recommendations! "I sense a banh mi smackdown coming..."
Sorry I couldn't make it, but it looks like fun was had by all. Darn looks like I missed a good time on Sunday - just to much to do at home. That's odd. But believable because pretty much every other food item i've had at Paradise was pretty bad, especially the beef la noodles. Maybe I've caught them on good days when they've *just* made the bao. Let us all know when all of your next crawls are to Chinatown. I'd love to take apart in the adventure plus show you all to some of my own nooks and crannys down there. @ justin- why don't you join the houston chowhounds? i don't actually blog about all of our adventures. there is a link on the homepage in the right frame under my info. J, Your organization and enthusiasm was (and is) awesome. I did'nt want it to end but as we found out, there are limits to our capacity to consume. Great group. Great crawl. Vietnam Coast on Hillcroft between Richmond and Westheimer makes the best banh mi I've ever had. The restaurant itself is pretty westernized and is just ok, but the sandwiches are AMAZING. Very meaty, excellent marinade, just the right amount of garlic mayo, they do not skimp. The bread is just perfect with just the right amount of crustiness. I keep meaning to ask where they get it (I don't think they bake it there). The only downside is that you are paying $4.95 for banh mi. Personally, I think it's worth it. @ anonymous - vietnam coast is actually on my list of restaurants to try. thanks for the reminder! 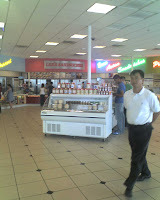 Some of the best banh mi are served at Parisian Bakery in the Viet Hoa shopping center on Beechnut and Beltway 8. Alpha Bakery is very good as well, but I can't get over the fact that the proprietor didn't wear a gloves one time she was making my sandwiches, right after she had accepted dirty bills. classic kitchen wins the award for the worst service i've ever had in my life. I'm not suprised! In Chinatown, the attitude of some restaurant owners/employees are terrible, as they never been trained and you have to begging them for the food. I realize this is an epically old post, but I just wanted to throw in my two cents. I've never had the XLB anywhere else but QQ Cuisine (right next door to FuFu!) but let me tell you, they are delicious. The wrappers are VERY thick, but tasty, and the pork inside is super juicy and flavorful. The leftovers even taste good after being refrigerated and reheated for twenty/thirty seconds wrapped in a damp paper towel. Also good at QQ is the cold shredded szechwan pork belly. Not as spicy as you might expect, but not bad. My father is obsessed with it. So, yeah. Again, sorry for posting on such an oldie. Don't worry, you're not the only one getting bad service at Classic Kitchen. I've had their XLB before and it was also clustered together. And they were pretty rude to us even though we ordered a ton of food! Lai Lai dumpling house was the worst. I went there thinking if it's call a dumpling house they must be good at making dumpling, right? WRONG!!! The frozen package from the store would be 10 time better and way cheaper. The soup dumplings come in this super thick and gummy wrapping with no soup inside, more like grease from the meat. The pan fried dumplings are equally thick and gummy and fried til it's rock hard. The shrimps inside of them are frozen and very small. That was by far the worst meal I had in Houston yet. Avoid it at all cost! Chinatown is really running great food courts. I will surely visit this place as I am about to visit Houston.